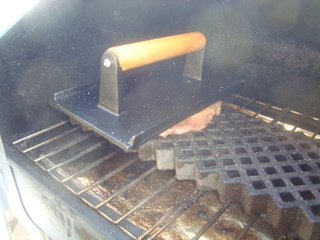 I am trying to develop another type of setup for competition steak cooking. I am also working on some more rub trials for the steaks as well. 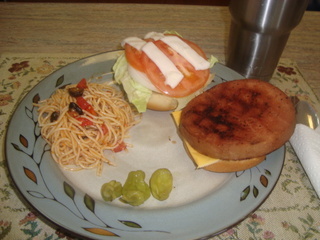 Anyway, I did another practice cook yesterday along with some other items. 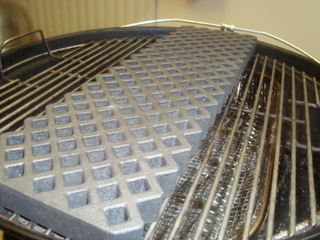 After a tip from a friend, I purchased a cast iron waffle grate insert that fits a commercial series 600 Char Broiler grill and cut it down to fit three of my table top grills including the CB500X, Weber Jumbo Joe, and my Davy Crockett pellet grill. 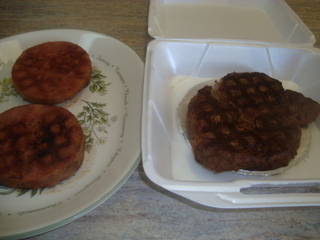 I trimmed and seasoned the steak about 45 minutes before the fire and then seasoned the bologna about 10 minutes before it went on the fire. 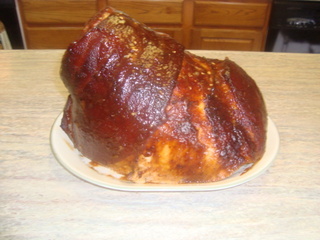 The ham was seasoned about 30 minutes before it went into the cooker. 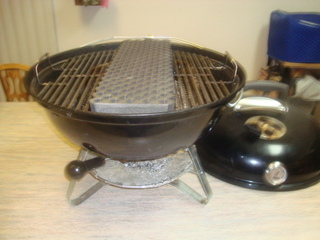 I brought the Davy Crockett pellet grill up to about 500 degrees and waited about 25 minutes to allow the cast iron grid to come up to temperature and then loaded the 16 oz. 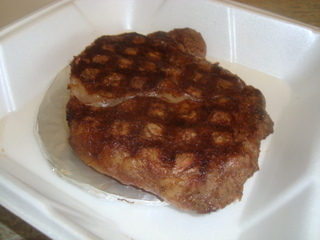 ribeye steak. I then placed a steak press on the steak for the first 5 minutes of the cook to be sure I get the very best sear marks on the “presentation” side of the steak. 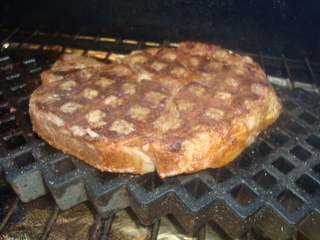 Turned the steak and finished the cook. I think it looked great coming off of the cooker. 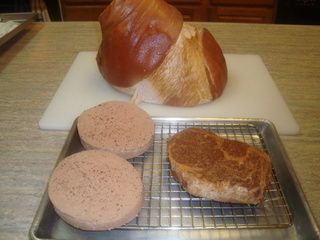 Next up was the bologna and I also used the steak press on this meat for a short period on the first side but it didn’t work as well with this meat. Probably should have used it on both sides of the meat during this cook. The results from the first part of my cook. 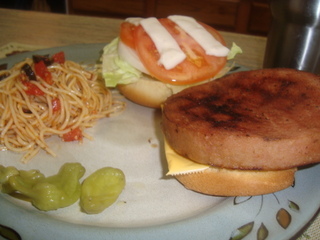 The bologna made for a fine lunch sandwich. 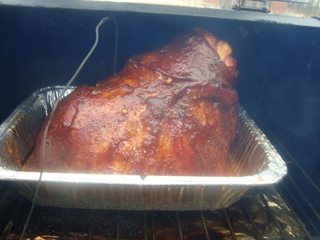 I dropped the temperature on the grill to about 335 degrees and loaded my 10-3/4 pound ham. 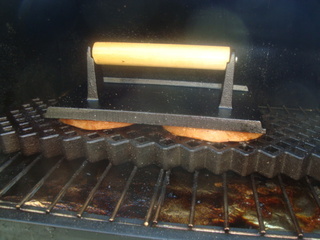 It was glazed several times with the “Sticky Orange Ham Glaze” during the cook. The ham will be sliced up and vacuum packed for the freezer. Great looking stuff and nice setup!! All looks good Dave, but that steak has my mouth watering.